The Artifex Forge is excited to announce the release of this highly original and versatile pack. 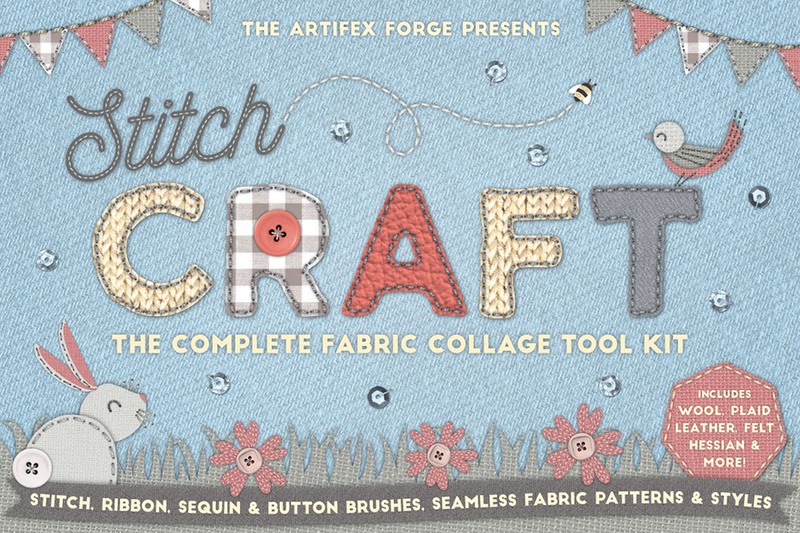 It contains all of the tools you need to create your own intricate, stitched, fabric collages in Adobe Illustrator. I’ve combined seamless bitmap textures and a variety of unusual vector craft brushes to bring you a kit that not only looks real but is also super-easy to use. The pack is perfect for so many themes and tasks such as weddings, celebrations, valentines, springtime, baby themed items, badges, logos, greetings cards and much more. • Add some glitz and glam to your collages! Like all the other material in the pack, these were sourced from the real thing. Recolor them to suit your design. • Made from real ribbons, they are ideal for creating banners, text or for adding details to your collages (you can see them working to great effect as the snowman’s scarf). I’ve supplied two versions of each ribbon, one that has been optimized to work with dark colors and one with light colors. I’ve also included three pre-made bows for use with the brushes. • Again, these were sourced from real buttons and have been converted into vectors. The advantage of brushes over vectors is that you can re-color them instantly and easily by just adjusting the stroke color. • All of the preview image scenes are included. Examine or re-purpose them. All elements are layered so you can use them to make your own creations. • A very thorough guide on how to load, apply and then edit the effects is supplied. Please read carefully all the way through as it provides all the information you might need on how to load and use these effects and brushes. File size is approx 2.49GB (2.72GB unzipped), offered as a three part download. This set looks amazing! Unfortunately, I don’t have Illustrator. Will the patterns, brushes, and styles work in Photoshop? or are they for Illustrator only? I know I can use the png & jpg files in Photoshop, but I think the styles, brushes, etc are what make this set so wonderful. Thank you so much for your comment and I’m so sorry to hear that you do not have Illustrator. Unfortunately the compatibility is completely at the discretion of the designer and they have only provided their brush and style files for Illustrator so my sincerest apologies for any disappointment caused! Rest assured we can certain pop in a request to our Product Team so that they can see if we can get in a similar pack for Photoshop in future! 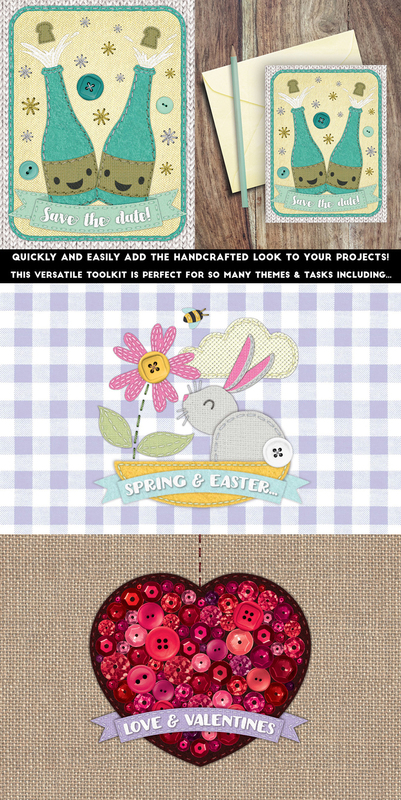 This digital fabric collage toolkit is fun and amazing! It’s been optimized to work with light and dark colors, the craftsmanship is just WOW! Wow thank you so much for your lovely comment Mar! Hi, Can you help me? I have CS6 and when I open the files there is nothing to see in many of them–even though there is just one layer. For example: In Stitch brushes.ai file there is only one layer entitled, Layer 3/Artboard 3. I have unzipped twice and am getting errors. Can you help me, please? Disregard comment. I loaded the stitch files as brushes and everything worked fine. A lot of fun!